Fly Fishing Jazz: An Art Form? I’ve often heard fly fishing described as an “art form,” and I’ve often wondered if that isn’t just a tad presumptuous. As this is the elk hunting season, when I do a lot of solitary walking and stump sitting (and admittedly not a whole lot of shooting), I recently opted for a little left brain v. right brain wrestling match to try and figure that one out. For starters, I decided that “art form” is probably more apropos than “sport,” but that’s because I played a lot of competitive sports in my growing-up years. Sports, to me, have always been synonymous with sweating and panting, trying to score points or go faster than other people. I think it’s a rule of thumb to assume that anything you can do while you’re smoking a cigar really shouldn’t count as a sport. Naturally, that also applies to golf, thoroughbred racing (the sport of kings), and tournament poker, which accounts for fair deal of sports programming on cable television these days. Games, sure. Sports, not so much. 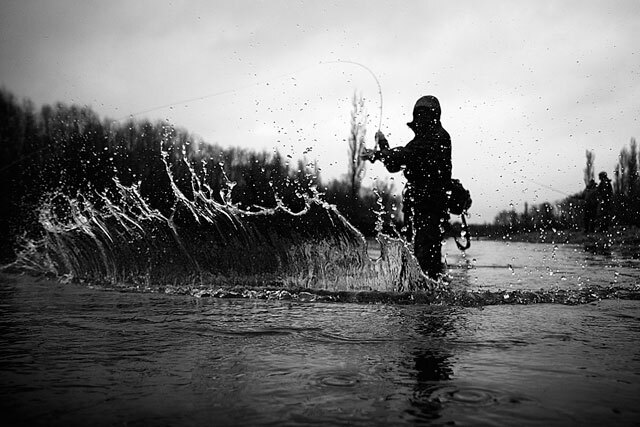 Fly fishing, like hunting, is part of the “sporting culture” lexicon, no doubt. But that’s an entirely different type of sport in the first place—namely “blood sport”—isn’t it? Which gets me back to “art form,” a far kinder, gentler way of describing this pursuit that includes many facets and variables but ultimately revolves around sticking a sharp object in the mouth of a fish, and imposing your will on that creature. If you Google “art form,” you’ll read the following definition: An activity or a piece of artistic work that can be regarded as a medium of artistic expression. Fly tying clearly fits that bill. It is an activity that yields artistic work, and the personalities and ideas of innovative tiers are always readily apparent. Casting… maybe a little less obvious, but sure… as an activity that involves unique shapes and execution, great casting is every bit as much the art form as architecture, sculpture, or water color. It’s just much more temporary, that’s all. The word from the definition that strikes me most—and what connects this thread to jazz (perhaps one of the only uniquely American art forms)—is expression. I believe that fly fishing is about expression, and that the more an angler expresses his or her ideas and patterns as he or she wades a river or works a flat, the more profound the experience and results will be. So maybe that’s it. Maybe we should call fly fishing an art form because every angler should endeavor to be an artist with rod in hand, rather than a hunter of fish. A presumptuous thought indeed. But I’m fine with that.